The entrance is through the wheelhouse, and you can sit by the fire. The roof opens you would think you were on the Croisette and you can see the Louvre. It's not a dream you are on board the Cachemire, the most luxurious yacht in Paris. Fabrics by Pierre Frey, porcelain by Raynaud, crystal glasses by Baccarat in this private sitting room reserved for the happy few (for 2 to 12 people), each sophisticated detail has been carefully thought out and bears a signature. 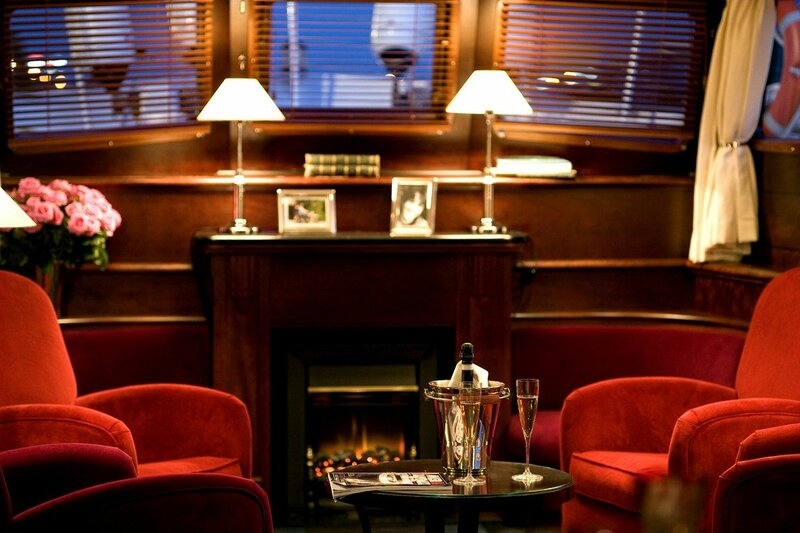 Yet you feel at home in this cosy 22 metre setting, surrounded by family photos and Venetian engravings. The most gentle journey you could ever dream of. An experience out of time, on the Seine. You will feel so comfortable that you will want to stay on board to sleep. Like its younger brother the Cachemire, the Acte III is selfishly luxurious. Designed by the famous Benetti shipyards in 1953, the Acte III has managed to retain the legendary spirit of Riviera yachts in the immediate post-war period with pure lines, a slender stem, rich panelling, and intelligent design. Built on two levels linked by a passageway, these 30 metres of the height of Italian elegance have covered many nautical miles in the boats lifetime. And now, after cross-crossing the Mediterranean for years, this mahogany traveller has found its place of rest the Quai Henri IV in Paris. Whether the cruise is studious or intimate, whether 10 guests are on board or 30, the Acte III is the perfect venue. The Don Juan II is to the Cachemire what Rome is to Venice, but they are both equally demanding, and share the same spirit. Classic, elegant, understated the Acajou embodies Yachts de Paris. Its warm and cosy setting is ideal for 40 guests. Chameleon-like, it is equally suited to receptions as to seminars and conventions. It is a sophisticated boat, 40 metres long, in shades of red, with 19th century paintings and mouldings. 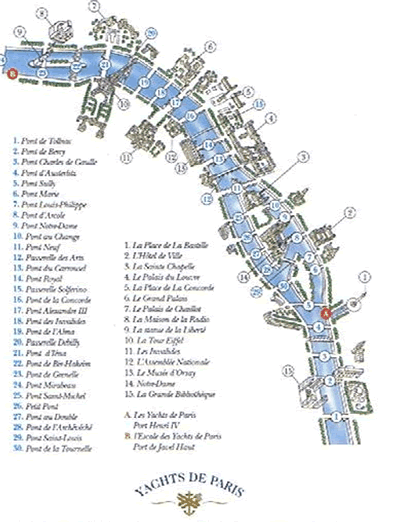 It stops at all the stop-off points in Paris, and is quite happy to head for the Stade de France or Giverny. The Victoria the twin of the Acajou was totally renovated in 2007. It offers an up-to-date subdued ambience. Stainless steel Art Deco wall lights shed light on the ebony panels, making subtle contrast of their strict lines and the long taffeta curtains. The neo-classical decor combining brown, silver and splashes of red is in keeping with the geometrically inspired furnishings on the upper deck. Honed, chic and classy, the Victoria rests lightly on the water, like a reed floating on the Seine. The Excellence bears its name well. Its regal its lines are those of the grandiose yachts of the Fifties. Its generous not only is it long (53 metres), its also wide (8 metres). Its graceful it has room to seat 150 people. Its light it has a natural aura and a number of light wells. Its majestic it has very high ceilings and its top deck is the best in the fleet. For all these reasons, the Excellence travels through Paris and its history with princely elegance. It is as if the Mirage was born from a dream; it is the most unusual of the Yachts de Paris boats. This is one of the trendiest venues in Paris. With a maximum capacity of more than 200 guests, it plays on the contrast of black and white, matte and shiny. This makes the Mirage a natural choice for product launches, clubbing, fashion parades, live shows, etc. It has everything that sparkles, by day and by night. A high-tech area beneath the spotlights, this ultra-design lounge with wall-to-wall flat screens never forgets that it owes everything to the Seine. Le Paquebot is an immense floating palace covering 700 sq.m. It exudes an aura of the golden age when transatlantic liners vied with each other in terms of luxury and savoir-vivre. The spirit of Le Normandie can still be felt on its monumental stairways; the soul of the Queen Mary is present in the 86 metre long dining room; souvenirs from Le France are everywhere on the triple deck, the ships rail, the launches, the imposing chimneys. Here is the library, which used to be the smoking room, echoing the splendour of days gone by. Le Paquebot, the largest boat on the Seine, is ideal for any grandiose and imaginative event. Nostalgic passengers will think for a moment that they are on an ocean liner; others will discover that a venue for an 800 guest reception in Paris can have a soul. Only available with prepaid Idéal Gourmet menu. This offer is available for bookings on Monday to Wednesday, at lunch and dinner, for May and June. The Seine river and Paris are a charming duo, and when the Don Juan II casts off, you have the privilege of enjoying the best « dinner-cruise » there is in Europe. If you combine with talent and professionalism the very hard art of presenting a Capital envied for its lights and its gold, with serving a gourmet meal prepared by Guy Krenzer, Meilleur Ouvrier de France (best worker in France), well then you start getting the idea of what awaits you on the Don Juan. The Chef always follows his golden rule: the love of true products, the respect of the seasons, and he very actively and “cuisinely” participates in this special cruise. 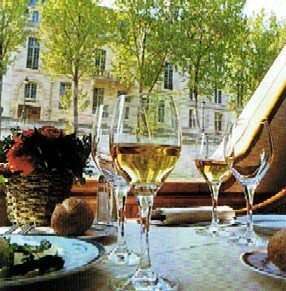 A luxury yacht in the heart of Paris, alcoves where everyone is free to contemplate the scenery while enjoying a gourmet meal. The ship itself reminds of the 30’s and the golden age of yachting. This most recent ship in the Yachts de Paris fleet elegantly combines the advantages of a modern boat with the discreet charms of an authentic yacht. This cruise manages to charm businessmen, leaves unforgettable memories for couples, it is a four course meal, not a mistake, and all with champagne. A night that will give life to dreams, out of time, far from the noise of the city, an unequalled change of scenery. Gourmet Cuisine and Paris go very well together, we already knew that, but on water, Yachts de Paris is the institution not to be missed.